Heyland, A., Croll, R., Goodall, S., Kranyak, J., & Wyeth, R. (2014). Trichoplax adhaerens, an Enigmatic Basal Metazoan with Potential. In Developmental Biology of the Sea Urchin and Other Marine Invertebrates (pp. 45-61). Humana Press. Flatt, T. and A. Heyland, eds. (2011) Mechanisms of Life History Evolution. Oxford University Press. Heyland, A., Vue, Z., Voolstra, C. R., Medina, M., & Moroz, L. L. (2011). Developmental transcriptome of Aplysia californica’. Journal of Experimental Zoology Part B: Molecular and Developmental Evolution, 316(2), 113-134. Miller, A. E., & Heyland, A. (2010). Endocrine interactions between plants and animals: Implications of exogenous hormone sources for the evolution of hormone signaling. General and comparative endocrinology, 166(3), 455-461. Neira Oviedo, M., Ribeiro, J. M. C., Heyland, A., VanEkeris, L., Moroz, T., & Linser, P. J. (2009). The salivary transcriptome of Anopheles gambiae (Diptera: Culicidae) larvae: A microarray-based analysis. Insect biochemistry and molecular biology, 39(5), 382-394. Flatt, T., A. Heyland, et al. (2008). 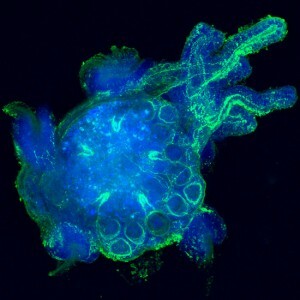 “Hormonal regulation of the humoral innate immune response in Drosophila melanogaster.” Journal of Experimental Biology 211(16): 2712-24. Reitzel, A. M., & Heyland, A. (2007). Reduction in morphological plasticity in echinoid larvae: relationship of plasticity with maternal investment and food availability. Evolutionary Ecology Research, 9(1), 109. Flatt, T., Moroz, L. L., Tatar, M., & Heyland, A. (2006). Comparing thyroid and insect hormone signaling. Integrative and comparative biology, 46(6), 777-794. Heyland, A., Price, D. A., Bodnarova‐buganova, M., & Moroz, L. L. (2006). Thyroid hormone metabolism and peroxidase function in two non‐chordate animals. Journal of Experimental Zoology Part B: Molecular and Developmental Evolution, 306(6), 551-566. Heyland, A., & Moroz, L. L. (2006). Signaling mechanisms underlying metamorphic transitions in animals. Integrative and Comparative Biology, 46(6), 743-759. Heyland, A., Reitzel, A. M., Price, D. A., & Moroz, L. L. (2006). Endogenous thyroid hormone synthesis in facultative planktotrophic larvae of the sand dollar Clypeaster rosaceus: implications for the evolutionary loss of larval feeding. Evolution & development, 8(6), 568-579. Bourlat, S. J., Juliusdottir, T., Lowe, C. J., Freeman, R., Aronowicz, J., Kirschner, M., … & Telford, M. J. (2006). Deuterostome phylogeny reveals monophyletic chordates and the new phylum Xenoturbellida. Nature, 444(7115), 85-88. Bishop, C. D., D. F. Erezyilmaz, et al. (2006). “What is metamorphosis?” Integrative and Comparative Biology 46(6): 655-661. Bishop, C. D., M. J. Huggett, et al. (2006). “Interspecific variation in metamorphic competence in marine invertebrates: the significance for comparative investigations into the timing of metamorphosis.” Integrative and Comparative Biology 46(6): 662-682. Blanckenhorn WU, Heyland A. (2005). The quantitative genetics of two life history trade-offs in the yellow dung fly in abundant and limited food environments. Evolutionary Ecology 18(4):385-402. Reitzel AM, Miles CM, Heyland A, Cowart JD, McEdward LR. (2005). The contribution of the facultative feeding period to echinoid larval development and size at metamorphosis: a comparative approach. Journal of Experimental Marine Biology and Ecology 317(2):189-201. Heyland A, Hodin J, Reitzel AM. (2005). Hormone signaling in evolution and development: a non-model system approach. Bioessays 27(1):64-75. Heyland A, Hodin J. (2004). Heterochronic developmental shift caused by thyroid hormone in larval sand dollars and its implications for phenotypic plasticity and the evolution of nonfeeding development. Evolution 58(3):524-538. Heyland A, Reitzel AM, Hodin J. (2004). Thyroid hormones determine developmental mode in sand dollars (Echinodermata : Echinoidea). Evolution & Development 6(6):382-392. Bernasconi, G., Hellriegel, B., Heyland, A., & Ward, P. I. (2002). Sperm survival in the female reproductive tract in the fly Scathophaga stercoraria(L.).Journal of Insect Physiology, 48(2), 197-203.